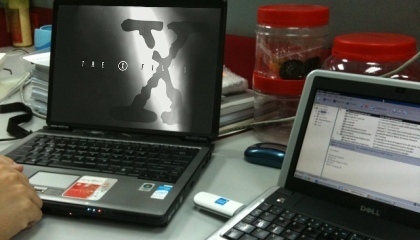 “This could be another X-File,” said a customer jokingly, as we reviewed an email problem at his office. While most email problems can be solved online or through a phone call, sometimes, on-site reviews are a must. Yesterday, for example, we visited a customer who had a case of missing attachments. Apparently, the problem only occurs in emails received from a particular sender, who sends out attachments to other email users using Outlook Express. To diagnose the problem, we ran a few tests with help from their technical team. In this scenario, usually it is the recipient who’ll make the complaint, rather than the sender, because it’s the recipient who’ll notice the missing attachment. Some recipients choose to switch to Outlook, and then the problem goes away. But, we weren’t satisfied with that shortcut solution. No, we had to get to the root of the problem, and trace it back to the beginning. After hours of reviewing and testing, we managed to determine that the issue originated in the Senderâ€™s computer. We’ve thought up a solution and we’ll be working hand-in-hand with their technical team to make sure that the problem will be resolved completely. Next Next post: How does the iPhone 4 Change the Way You Work?